November 1st 2017 was my first day as Director of Rowing at London Rowing Club. Having spent the previous couple of months talking to Tim Grant and Bob Downie about taking on the role, the day arrived and I was looking forward to getting started. My previous employers, the GB Team, were gracious enough to let me overlap my final month at Caversham and spend time at the Club. The first order of business was to meet the athletes and outline the way I wanted them to operate. I talked about team spirit, group culture and cohesion as well as training. I thought it was pretty good but, much to my dismay, several people walked out as soon as I had finished! I had decided that to achieve success the athletes should train together as much as possible, so the programme and training times were set up to allow for this. The group, which comprised about 20 rowers, started training under the new programme and I was confident it would develop their fitness, strength and mental toughness. The second area to look at was the fleet of boats at the Club. To my mind there were large parts of the fleet which weren’t being utilised. Quite a few boats were covered in dust and others were in a bad state of repair. The process of repairing, selling and buying equipment started in earnest and the first boats went out of the club before Christmas. My plan was two-fold – buy boats for the squad to race in which are befitting of a club of London Rowing Club’s stature and to buy boats for the Irregulars and recreational side of the club which significantly upgraded what these groups were currently using. The plan is ongoing and much progress has been made in both areas. As the winter season progressed it was clear we needed to add to the current squad with some new athletes and a recruitment strategy was devised and implementation began in May with Steve Salter attending BUCS, the universities championships, in Nottingham. Since then, Steve and I have spoken to numerous rowers about LRC and, along with our social media campaign, we have raised the profile of the club within the university sector and beyond. 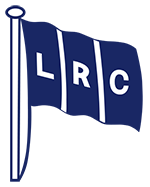 Recently, I spent a week with Durham, Edinburgh and Newcastle university boat clubs extolling the virtues of LRC, which will hopefully lead to athletes who are coming to London for work after university choosing LRC as their rowing club. Throughout the racing season the crews improved relative to their opponents and after a training camp in Varese, Italy in June we had four crews racing at Henley Royal Regatta. Although none of the crews raced beyond Thursday, I felt it was a reasonable set of performances from the squad. Over the summer break, Steve was very busy recruiting new athletes for the squad and this year we have started the season with a squad which I believe is stronger than last year’s. Our social media campaign has had a significant influence, with several of our new athletes mentioning it when asked why they joined London. The 2018/19 season will be an interesting one as we review our strategies and look for ways to improve our standards and attract the best calibre of rowers. All in all, my first year in the job has been challenging and rewarding and it has given me the motivation to continue driving the Club upwards with a view to returning to the top of domestic rowing in the UK. This is a multi-year project but one which can be achieved with drive, enthusiasm and belief. Our contractor is making good progress. The steelwork forming the new gym buildings is now in place and the walls surrounding the large gym have also been completed. As a result, it is now very easy to see how the gyms will look - they will be great spaces. The last few weeks have not however been without difficulties. The steelwork has been very well designed and fabricated and fitted together perfectly but ours was the last job the steel sub-contractor completed before going into liquidation. It has taken a lot of time to sort this out and we would have liked to have been where we are now a few weeks earlier. We are now through this and the contractor is, at the time of writing this update, attaching cleats to the beams and, by the time this update is published, members walking down Spring Passage will be able to see the purlins being attached to the cleats, forming a framework over the steel and walls, ready to receive the cladding. The cladding sub-contractor has been visiting the site to take numerous measurements to ensure that the insulated cladding panels are fabricated by the manufacturer to the exact sizes required. There is a huge amount of work in detailing the cladding with connections and interfaces with windows, glazing, guttering, ventilation units and louvres. We are working very hard with the contractor and its supply chain to have the cladding contractor on site and ready to go as soon as the purlins have been attached. 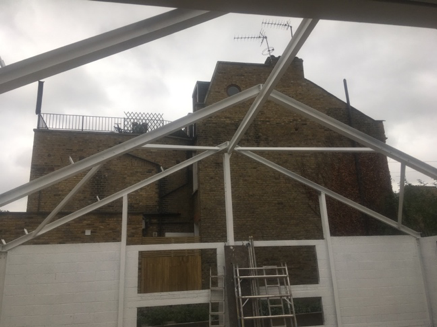 If you look at the photographs carefully you will see the cleats being fixed and some of the purlins fixed in place already. Members will be able to see the disabled access ramp being constructed in the entrance courtyard. This will be paved and faced with bricks to tie in with the general appearance of the courtyard. The cycle racks have had to be removed; there will be provision for bicycles when the re-development has been completed and members are asked to bear with us until then. For more information, contact Peter Halford, Simon Harris or Eddie Markes. London’s coxed four of Shaun Martin, Ralph Humphrey, Adrian Theed, Stewart Harries and cox Theo Robinson won the Senior Masters Coxed Fours at the 2018 Head of the Charles at the crew’s maiden attempt. Starting in the second half of a field of 49 and at the front of the new entries, London’s four set off at a pace that saw them catch the crew in front within the first minute and before the BU Bridge. Race rules forbid overtaking until after crews clear BU Bridge and London’s four had to stop rowing before the Bridge to allow the crew to pass ahead and avoid disqualification. Picking up once clear London settled into a strong pace and overtook four crews in the cross-tail wind around Magazine Beach turn and onto the Power House straight. Approaching Weeks Bridge the crew closed quickly but were unable to pass three more crews ahead and again London had to stop rowing to allow those crews to pass cleanly through the bridge and avoid incurring penalties. This threw London off their racing line and Theo’s skilful steering minimised further losses as London passed all three in the tricky section from Weeks through Anderson Bridges and out past the Harvard Men’s Boat House onto the Big Turn. The crew then had a clear run into a stiff headwind for the final mile and into the last sector from Elliot Bridge with one more crew overtaken just before the finish line. London’s time of 18m 09.5s was 1 minute off the record in conditions where very few records were broken. Three other British crews finished in the top 10, with Molesey second 3.5 seconds adrift, Monmouth seventh and Maidenhead eighth. Special thanks go to Concept2 who provided the oars for the race and to Hudson Boats who supplied a very impressive and beautifully equipped hull. The Irregulars have now finished Wednesday evening outings for the Winter. These will start up again in the Spring. We have a wonderful new boat - a Janousek - which is interchangeable between a quad and a four. Thanks are due to Rob Dauncey and Steve Salter for driving all the way to Ghent to collect it. This boat replaces the Simon Rippon which, sadly, has reached its end due to structural wear and tear. Those who have rowed in the new boat, which is shortly to be named Rob van Mesdag, have expressed delight. Three Irregulars’ crews took part in the Vets’ Fours Head on the 4th November - which I believe is a present day record for our group – consisting of quads, one in each of Categories D, E and H. A number of those taking part had never raced in a Head before so particular congratulations are due to them. There is talk of putting together an eight for the Vets’ Eights head in the Spring. The number of people wishing to take part in next year’s Vogalonga on the 9th June 2019 is building steadily, with fourteen people so far on the list of prospective participants. Miles Preston will be organising the LRC contingent again next year and is keen to increase the number of our boats taking part from three to four (which will mean twenty rowers taking part rather than fifteen), if possible. If you are interested in either rowing in an Irregulars’ Eight in the Vets’ Head in March and/or taking part in the Vogalonga, please will you email Miles Preston (miles.preston@milespreston.co.uk) to let him know. The Armistice Centenary Service and Lunch commemorating the fifty members of the Club who died in the Great War took place at the Club last Wednesday, the 7th November. A full article about this most memorable occasion will be appearing in the December edition. 'On 5th March 1921, the original dedication of the war memorial tablet took place, which included an address by the then President, Lord Ampthill. He was well suited to the task – an eminent oarsman, he had won the Goblets twice with Guy Nickalls, and he had served throughout the Great War, during which he was twice Mentioned in Despatches. He could speak with the fervour and emotion of someone who had seen it for himself, and having known personally some of the men whose names the tablet listed. And here we are, over 97 years later, to re-dedicate this tablet and to commemorate the end of the Great War, the war to end all wars, with the perspective to know that … it did not. It has therefore been suggested that these terrible sacrifices were somehow in vain, and that it was all for nothing, but any reading of the history of those years will reach the conclusion that war in 1914 was going to be, one way or another, inevitable, and that the youth of this country were going to be called upon to defend what the country in general, and they as individuals, felt was right and decent. This was no blind patriotism, no “my country right or wrong”, but a solemn determination to defend their homes and to stand up for their ideals. They were, mostly, young, fit, energetic, well-educated and inculcated with the rowing man’s concept of being part of a crew, with a determination not to let their crew-mates down. This obviously made them ideal officer material, but also made them particularly vulnerable to war’s dangers. I have had no experience of war or military service. As an aside, my parents married at the end of May 1944, my father having to go straight from Portsmouth Registry office to his ship for D-day, with my mother not knowing whether she would see him again, and she didn’t until his first leave that September. Unsurprisingly, I appeared in June 1945, a child of the peace that has largely endured since then, so I cannot speak with the depth of understanding that my illustrious predecessor as President had, and it is this understanding that I find hard to grapple with. How it felt to be waving goodbye to a father, son or husband, in the knowledge of the real chance that one was saying goodbye for ever. Or later, the agony of watching the telegram boy coming up the road, not knowing at whose house he would stop. Or for the man himself, returning to the front after his leave, in the full knowledge of what he would be facing.